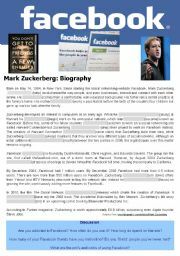 Short biography of Mark Zuckerberg, co-founder of Facebook. Text has gap-fills to review tenses including passives, past tenses and present perfect. Answers on page 2 although several other answers may also be possible - mine are not definitive! 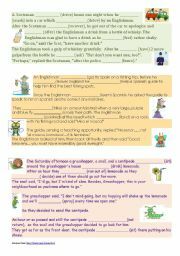 However, this could be useful as class discussion on context of tenses. 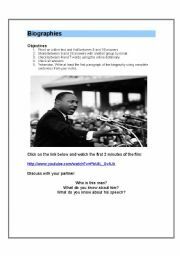 2 page Int/ Up-Int worksheet version of my online resource about the film Slumdog Millionaire. Text adapted from Wikipedia.org. Includes tense work on passives, gerunds and present continuous, and spelling and reading comprehension. 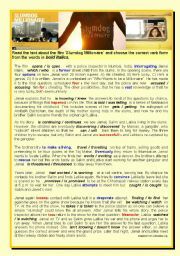 Teacher´s notes/ answers and links to youtube trailer on page 3. Low level CV preparation worksheets. 4 pages. 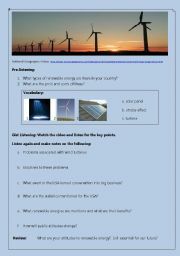 Watch the video from National Geographic on renewable energy in Sweden and USA and complete the worksheet activities. For upper-intermediate and advanced students. Answers on page 2. 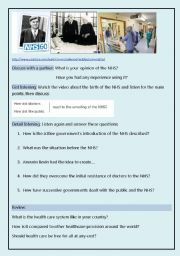 A video comprehension worksheet about the birth of the NHS for advanced learners. Includes discussion questions, listening tasks, lots of high level vocab. Answers on p2. Video taken from YouTube - link on worksheet. 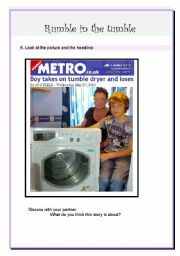 5 page Int/ Up-Int reading work pack using a story taken from the Metro Newspaper about a boy who gets stuck inside a tumble dryer. With reading comprehension questions, vocabulary and summarizing exercises and answers. Youtube video on 10 things to do in Dublin with comprehension questions. Reading and comprehension activities based on the film Slumdog Millionaire and a text adapted from Wikipedia. Spelling, synonym and tense work including passives, state verbs and gerunds. Intermediate or upper-intermediate. 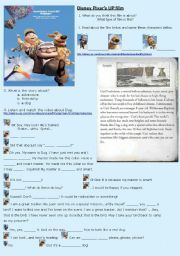 Online worksheet from the Disney film ´Up´. Watch the film clip about Dug the dog and type in the missing words.